Welcome to the wonderful world of armadillos. This website is entirely devoted to the armadillo. 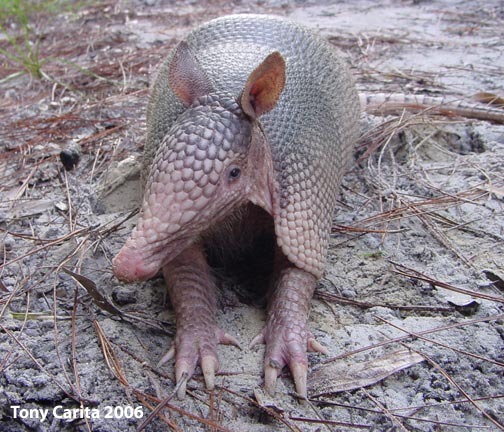 This website includes biological information on all twenty recognized species of armadillo — the most complete collection of factual armadillo information on the internet. There are pictures for many species, and a small number of video clips. You will also find articles diagramming the natural history of the armadillo, descriptions of the scientific and medical research uses of the armadillo, and some (hopefully) helpful suggestions about caring for sick or injured armadillos. This site also contains pages discussing common problems caused by armadillos, complete with suggestions on how to solve them. Please browse the site, or try a search if you are looking for anything specific. If you can’t find what you are looking for on this website, you can check the armadillo links, or email me if you have a question that is not answered here. I hope you find this site helpful, and thank you for visiting Armadillo Online!